Declan Kidney has been confirmed as London Irish's director of rugby having initially joined as a technical consultant in March. 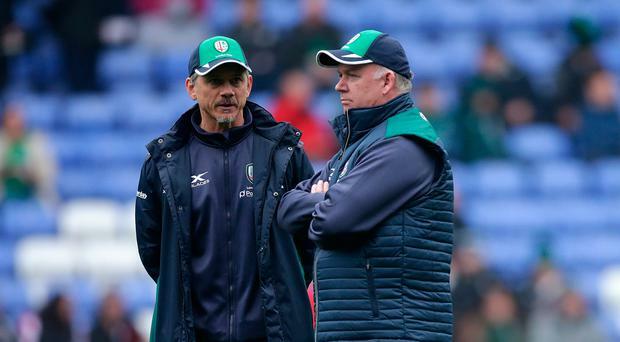 The former Ireland Grand Slam-winning boss took on the role along with Les Kiss, but the pair's late arrival was not enough to stop London Irish from being relegated to the Championship. The English side have big plans to win immediate promotion back to the Premiership, and Kidney and former Ulster boss Kiss are seen as a major part of the club's ambitions. "We are excited about the future," Kidney said. "A number of players have moved on for one reason or another, but we are very enthusiastic about the commitment that has been shown by a talented young breed of players to London Irish. "We have an Academy with a proven track record of bringing through talented young individuals, some good new signings, and senior players who have shown the willingness to help us develop a sustainable squad. "If we all work hard the future can be bright for us and we can achieve all our goals. "We are building a squad that is not just good enough to gain promotion from an extremely challenging and competitive Championship, but who can then use the lessons from this season should we get back to the Premiership in 2019." The club said that it was an "easy decision" to hand a permanent role to Kidney who, prior to two months ago, hadn't been involved in professional rugby since working as director of sport at UCC in 2013. "Declan has been brilliant since arriving as technical consultant," London Irish chief executive Brian Facer added. "We've seen players and staff alike bring a positive approach to their work both on and off the pitch." Meanwhile, South African referee Stuart Berry will be in charge of Saturday's Guinness PRO14 final between Leinster and the Scarlets at the Aviva Stadium. Elsewhere, Wasps flanker Jack Willis has been ruled out for up to a year after he injured several knee ligaments, including a rupture of his ACL during the defeat to Saracens last weekend. The exciting 21-year-old was due to tour South Africa with England next month, when he was expected to win his first cap.